In a landmark ruling on Monday the Jerusalem Magistrate’s Court has seemingly allowed Jews to pray on Temple Mount – a highly divisive issue that was one of the catalysts for the Second Palestinian Intifada. The ruling is a victory for Rabbi Yehuda Glick, a hardline Jewish activist, who brought an action against the Israeli police for banning him from visiting the site for two years. Glick was banned from visiting Temple Mount between 2011 and 2013, after a Channel 10 broadcast showed him uttering a Jewish prayer on the sacred site. Last year, Glick was also seriously wounded in an assassination attempt by a Palestinian extremist. Temple Mount is of extreme religious importance to both Judaism and Islam and is also significant to Christianity. Both Israel and the Palestinian Authority claim sovereignty over the site, and so it has been a major source of tension in the Arab-Israeli conflict since the 1967 War when Israel captured the Old City of Jerusalem where Temple Mount is located. 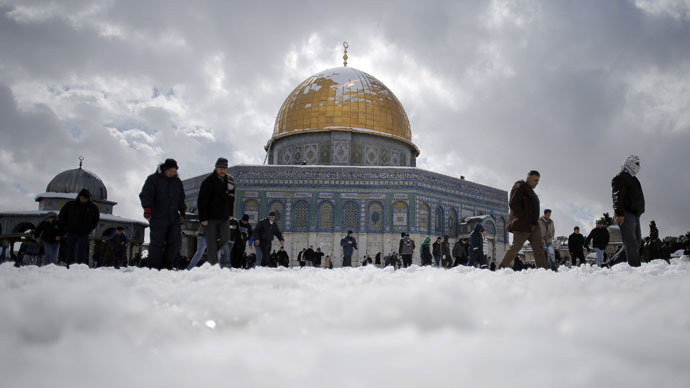 Since 1967 Israel has given control of the mount to the Jerusalem Islamic Waqf, and in an attempt to keep the status quo has stopped prayer there by non-Muslims. Israeli security forces also say that non-Muslims worshipping on Temple Mount incite Palestinian violence. So although the Jewish Supreme Court in theory allows Jews to pray on the site, it has also said that the security services have the right to consider wider security when policing the area and allowing non-Muslims to pray there. Glick was also awarded 500,000 shekels ($125,303) in damages NIS 150,000 ($37,588) in legal aid costs. Glick’s attorney, Aviad Visoly, said that the ruling will effectively allow Jews to pray on Temple Mount. “Essentially, the court took the ruling of the Supreme Court regarding the right of Jews to pray at the Temple Mount, and implemented it in practice,” he said. But Arnon Segel, an Israeli journalist and commentator on issues concerning Temple Mount, was skeptical that in reality Jewish prayer would be allowed on the site, the Jerusalem Post reports. Prime Minister Benjamin Netanyahu re-committed in November to upholding the status quo not to allow non-Muslim prayer on Temple Mount. The police may also decide to appeal both the ruling and the financial reward. In 2000, when Ariel Sharon visited Temple Mount, it triggered violent protests from Palestinians and was one of the catalysts of the Second Palestinian Intifada.